From Starstreamresearch.com, and probably written by herself: Caryn Anscomb is an independent researcher in the field of cultural shamanism, world religions, anthropology, and phenomenology. She is the director of an accountancy firm based in the UK. Caryn Anscomb acted as a key source and contributing author to STARstream Research beginning in 2006, and has continued to advise on important results from her independent research. In 2006 and 2007, she made several trips to the United States and during her travels she met with Ron Pandolfi, an intelligence official affiliated with the U.S. CIA, DIA, and ODNI. 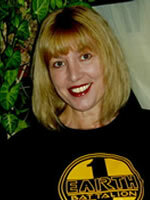 As a contributing writer, Caryn Anscomb’s many exclusive original contributions to the STARstream Research public access website STARpod.org are her articles are "Confessions of a Crop Circle Maker," the five-part UFO series "Trickster Tales," "Anomalous Mental Phenomena and Sleep Paralysis," and the often humorous "Disclosure Deli Blog." Driven by a strong interest in anomalous mental phenomena, Ms. Anscomb, who is a British citizen, came to the United States in 2006 and 2007 to uncover the truth behind UFO-related stories being spread by former US intelligence officers. During her investigations, Ms. Anscomb was accused of an affiliation with Britain’s Secret Intelligence Service, MI6. In early 2007, Ms. Anscomb made a road trip back from Dr. Hal Puthoff’s Austin research facility with Richard Dell Jr. According to Laura Eisenhower Mahon, great-granddaughter of President Dwight D. Eisenhower, when Dell returned home to North Carolina, he told her he had been travelling with a woman from MI6. Ms. Anscomb heartily and good-naturedly denies any affiliation with British Intelligence.